The Chase for the NASCAR Sprint Cup and the inaugural NASCAR XFINITY Series Chase took on a whole new dynamic after a double-header Sunday at Charlotte Motor Speedway. At the end of the day of 800 miles of racing, both Chase formats saw major shake-ups. To kick off the day, the first race of the second round of the Chase for the Sprint Cup saw five of the 12 Chase drivers have issues – including Richard Childress Racing’s Austin Dillon. Racing hard to get inside the top 10 just past the halfway point of the event, crew chief Richard ‘Slugger’ Labbe called for two tires on the sixth caution of the day. The call put Dillon’s No. 3 Dow Coating Materials Chevrolet on the inside of the front row for the restart. While the contact ended Dillon’s day early, it also collected fellow Chase driver Chase Elliott. Although Dillon was behind the wall, a number of other Chase drivers also struggled during Sunday’s Bank of America 500. Denny Hamlin finished 30th with an engine issue, Elliott was 33rd after the wreck on the restart, Joey Logano hit the wall multiple times and finished 36th, while Kevin Harvick also had engine issues that resulted in a 38th-place finish. As a result, Dillon heads to Kansas Speedway this weekend – the second race of the Round of 12 – just three points behind Hamlin for the eighth and final transfer position. Still, Dillon knows the team has to be aggressive if they want to advance to the next round of the Chase. “This entire Dow Coating Materials team will have to work hard the next two weeks to get the points back,” he said. “There have been a lot of people that are in the Chase that have wrecked so far. We just have to do a lot; we have to win one of the next two races. I believe we can do just that." While Sunday’s Sprint Cup Series race kicked off the second round of the Chase, the XFINITY Series event was the first elimination race of the opening round. Heading into the race, all three full-time RCR entries were hoping to advance to the next round, which begins next weekend at Kansas Speedway. Brendan Gaughan was fourth in the Chase standings, 11 points ahead of eighth, while Ty Dillon was ninth, three points behind the cutoff, and rookie Brandon Jones was 12th, 18 points back. 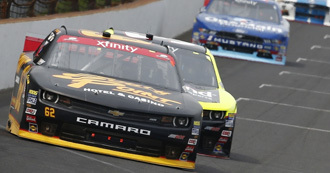 Over the course of 200 laps on Sunday afternoon at Charlotte Motor Speedway, the RCR drivers did all they could to advance. Gaughan had a quiet and consistent day in the No. 62 American Ethanol / Sheetz Chevrolet, finished 13th and advancing to the Round of 8. For Dillon and Jones, however, their Chase efforts came to an end when the checkered flag flew. Both drivers were involved in incidents not of their own making in the first Chase race at Kentucky Speedway on Sept. 24, putting their teams in a hole for the opening round. While Dillon was on the edge of racing his way into the Chase during Sunday’s event, a late-race incident between the No. 48 of Brennan Poole and the No. 44 of J.J. Yeley allowed No. Darrell Wallace Jr. to gain a position in the closing laps, which bumped Dillon from the top eight. Disappointed in not advancing to the next round, Dillon hopes to contend for wins over the remaining four races. “We're obviously really disappointed in not advancing to the next round,” said the driver of the No. 3 WESCO Chevrolet. “We feel that we're a team that could have made it to the final round and be there on the podium in Homestead. We just didn't have it here today … We know we're better than this, but just got behind the eight ball in Kentucky with that wreck in the final laps. We'll just continue on, try to win a few races and finish out the season." For Jones, it was likely going to take a victory at Charlotte to advance to the next round of the Chase after struggles at Kentucky and Dover. Starting fifth, Jones and the team adjusted on the handling of the No. 33 Nexteer Chevrolet throughout the race. However, an ill-timed caution trapped Jones a lap down and a pit road speeding penalty further hindered his efforts. Despite not advancing, Jones believes making the inaugural XFINITY Series Chase was a success. “My expectation for this Chase was to make it as far as I possibly could,” said Jones. “I didn't really set an expectation for where I wanted to end up. If you took away the poor finishes at Kentucky and Dover we would have been OK. We had good speed at both those tracks and should have had top-five finishes there. I hate that we did not advance, but it's just part of the game. We'll come back strong next year and go for it again." Both the Chase for the Sprint Cup and the XFINITY Series Chase continue next weekend at Kansas Speedway.